Since 2012, Moscow has been trying to rally the Western powers to its cause – to defend civilisation against jihadism, as the world was once united against Nazism. In order to do so, it first of all dissociated the White House from the combatants that the United States call « rebels », and whom Moscow regards as «jihadists». Today, it is trying to isolate Turkey. Far from being a diplomatic epiphenomenon, the cessation of hostilities in Syria marks an about-face. Washington has just admitted that there are no « moderate » armed groups, or none left. We are wrong to analyse Russian politics from the Arab or Western point of view. Russia has its own view of jihadists, with whom it is familiar since 1978, when they [sponsored by the CIA] came to lend a helping hand to the Afghan Pashtuns against the Communist government in Kabul. 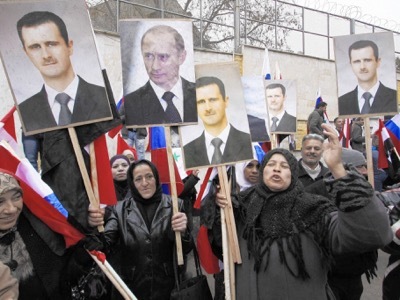 Demonstration at the Russian embassy in Damascus. Vladimir Putin personally fought the jihadists from the Caucasus, in particular the Islamic Emirate of Itchkeria (the second Chechen war 1999-2000), and beat them. At the time, the Arabs claimed to support tbe Russian Muslims, although they did not understand what was happening there, while the West, after the collapse of the Soviet Union, applauded any group who attempted to pursue the movement of the dislocation of Russia. However, on the ground, there was no difference between yesterday’s Emirate and today’s Caliphate. The charia was still applied, and heads were chopped off in Grozny just as they are today in Rakka. Atrocities by the jihadists of the Caucasus. Here in Dagestan, 1999. Today, despite propaganda claiming that the war in Syria is a war against Islam, or that the Syrian Arab Republic is an « Alawite (sic) dictatorship (re-sic) » which massacres Sunnis, the facts remain – the Syrian Arab Army currently fighting the jihadists is composed of 70 % Sunnis. In 2012, which is to say almost at the beginning of the war, at the moment when the United States DIA warned the White House against the force that was to become Daesh, Vladimir Putin declared that Syria had become a « Russian interior question ». Since then, he has been trying to create an international Coalition with the West against the jihadists. Russia remembers how the world changed in the 1930’s. At that time, the King of England, Edward VIII, was a public supporter of Nazism. Montagu Norman, the governor of the Bank of England, financed Adolf Hitler’s accession to power with the Crown’s money . The British thought that in this way, they were supporting a state capable of overthrowing the Soviet Union, which had eliminated Tsar Nicolas II, and was a threat to their capitalist interests. However, during the Second World War, they allied with Stalin and Mao against Hitler. In these archive documents, revealed by the Sun, the future King of England, Edward VIII, teaches the future Queen Elizabeth II — then aged 6 — to make the Nazi salute. Vladimir Putin hopes to be able to overturn today’s alliances, as was the case in the period 1936-39. This is why, over the last few years, he has been working to treat the United States as « partners », even while Washington was stabbing him in the back, organising demonstrations in Moscow against his governement (2011-12) and mounting a coup d’État in Ukraine (2013-14). On the 10th February, Russian ambassador Vitali Tchourkine distributed to all the members of the Security Council an intelligence report concerning the activities of Turkey in support of the jihadists . This two-page document presents ten indisputable facts. It attests to the fact that Turkey is a gangster-state which for many years has been deliberately violating a quantity of UN Resolutions. Each of these facts connects to networks and agents who once supported the Chechen jihadists. In those days, the Turkish state as such was not implicated, but the Welfare Party (Refah). Today, Refah has been disbanded and replaced by the AKP. Since the AKP is now in power, the Turkish state is now implicated . Today, the resolute Russian bear is attempting to separate Turkey from NATO. The future of humanity depends on this operation. Either Turkey stays in the Atlantist Alliance, thus able to support the jihadists, not only in Syria, but also in Iraq and Libya, and, finally, all over the world. Or else NATO distances itself from Turkey, in which case the United States and Russia would effectively be allied to fight the jihadists efficiently, wherever they may be. It seems that on the 12th February, the Russians were able to separate the White House from the neo-conservatives and liberal hawks who support Turkey and the jihadists. Sergey Lavrov and John Kerry agreed to create two work groups, which they co-preside, which relegates the UNO to the role of simple clerk . In other terms, Jeffrey Feltman, who has been using his functions as United Nations number 2 to sabotage all efforts for peace over the last three and a half years, has now been benched . The result ? In only 10 days, Russia and the United States have been able to conclude the conditions for a cessation of hostilities which has been awaiting finalisation since 2012 . 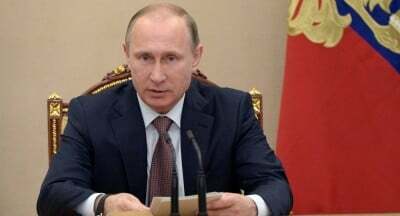 President Putin decided to announce personally on TV the conclusion of the agreement with the United States for the cessation of hostilities. This cessation of hostilities was firmly rejected by the « National Coalition for Syrian Revolutionary and Opposition Forces », whose President, the Turco-Syrian Khaled Khoja, commented in a letter to the Security Council – « It is absolutely scandalous to conclude bilateral agreements with Russia on a “cessation of hostilities”, when these agreements do not concern one of the main killers of civilians in Syria, the Russian Federation. It is high time for Russia to leave Syria and end the brutal war that it is waging against our fellow country-men » . This agreement is in reality a trap aimed at destroying the whole system created by the neo-conservatives and the liberal hawks. Already, during the Genève 3 negotiations, Russia had patiently revealed the bad faith of the « opposition » supported by Saudi Arabia and Turkey. This opposition had already discredited itself without any help by its procrastination. The question is not so much the representativity of the opposition, but to show that it has no desire to improve the living conditions of the Syrian people, only to overthrow the Syrian Arab Republic. The comment quoted above is convincing enough, since, contrary to M. Khoja’s allegations, the cessation of hostilities does in fact concern Russia, but not the groups listed as terrorists by the United Nations. The cessation of hostilities is aimed at facing the armed groups with their responsibilities. All they had to do was sign up with Washington or Moscow to avoid being bombed by the Russians or the Syrians, but in this case, they would have been obliged to renounce their project for the overthrow of the Syrian Arab Republic, and join a political process in favour of a secular, democratic Syria, in other words, to abandon the dream of an Islamic state. Only 97 Katibas of the thousand in existence would have dared to engage in a process which makes them « traitors » to the Turkish cause, and marks them as the next victims of their jihadist ex-comrades. Moreover, the Western powers could not have dreamed of a better outcome. On the 15th December 2015, during a Senate hearing, General Didier Castres, responsible for French external operations assured that the total number of combatants susceptible of being moderates did not exceed 20,000 . While in January 2016, a German intelligence report affirmed that the proportion of Syrian combatants participating in all the armed groups in Syria would not exceed 5 % . This is exactly the result that Kerry and Lavrov were looking for when they spoke of a cessation of hostilities and not a cease-fire – the second expression being the only one with legal consequences. This enables us to understand John Kerry’s answer to the question posed by a senator during a parliamentary hearing concerning an eventual « plan B » for use, if necessary, as a get-out clause. If the cessation of hostilities fails to work, there could be no partition of Syria, simply because the plan for the cessation of hostilities will have shown that the choice is not between Damascus and the « rebels », but between Damascus and the « jihadists ». For President el-Assad’s advisor, Kerry’s « plan B » should be aimed at fighting the jihadists. By the same logic, the Luxembourg Minister for Foreign Affairs, Jean Asselborn, declared to Der Spiegel that NATO would not allow itself to get dragged into a war started by Turkey against Russia . Article 5 of the NATO Alliance provides for the support of a member state only when it is directly attacked, not when it initiates a conflict . Comments confirmed by Germany to the Daily Mail . As from now, the White House is preparing to sacrifice Recep Tayyip Erdoğan, who will probably be held responsible for everything that has gone wrong in the region. The Turkish President may be assassinated, like his predecessor Turgut Özal, in 1993, or else be overthrown by those close to him. Failing that, the war will be displaced from Syria to Turkey, and Vladimir Putin will have won his bet – to shift the front lines in such a way as to cause the Western powers to fight alongside him against the jihadists that they themselves created. Russia did not go to war in Syria to defend economic interests or resuscitate a Cold War alliance, but to fight the jihadists. Since 2012, Russia has been trying to split the Western powers from the jihadists, whom they created and have supported since 1978. By conluding the Munich agreement, John Kerry has accepted to relegate Jeffrey Feltman, the leader of the neo-conservatives in the UNO, to a subordinate role. By proposing a cessation of hostilities, he has made it possible to separate the reasonable Syrian combatants from the jihadists. “Anglo-American Money Owners Organized World War II”, by Valentin Katasonov, Strategic Culture Foundation (Russia) , Voltaire Network, 7 May 2015. “Russian intelligence report on Turkey’s current assistance to Daesh”,Voltaire Network, 18 February 2016. “How Turkey supports the jihadists”, by Thierry Meyssan, Translation Pete Kimberley, Voltaire Network, 22 February 2016. « Letter dated the 18th February 2016, addressed by the representative of the National Coalition for Syrian Revolutionary and Opposition Forces ». UNO Document S/2016/165. « Syrienkonflikt: Warnung aus der Nato an die Türkei », Der Spiegel, 19. Februar 2016.